NOW AVAILABLE FOR PRE-ORDER AT AMAZON - click here! James Egan is editor of this new volume in the prestigious Conversations with Filmmakers series, to be published by the University Press of Mississippi in November of 2011. As lead researcher, Jess Kreusler, Creative Executive of Motion Pictures at Wild at Heart Films, played an important role in the creation of this historically-important book. This series has been an invaluable resource for film scholars world-wide. 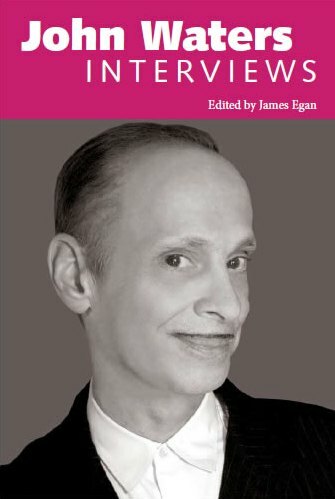 "John Waters Interviews" will be launched at the Museum of Modern Art, with a special retrospective evening of Mr. Waters' contribution to American cinema. The films of John Waters are some of the most powerful send-ups of conventional film forms and expectations since Luis Buñuel's and Salvador Dali's Un Chien Andalou. In attempting to re-invigorate the experience of movie-going with his shock comedy, Waters has been willing to take the chance of offending nearly everyone. His characters have great dignity and resourcefulness, taking what’s different or unacceptable or grotesque about themselves, heightening it and turning it into a hand-made personal style. The interviews collected here span Waters’ career from 1965 to 2010, and includes a new one exclusive to this edition.